Homeschool Review: Shhh!!! It's Almost Here!!! "What's that?" you ask. "What's almost here?" That's right! 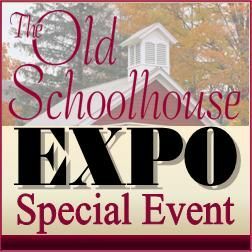 The Old Schoolhouse Expo Special Event is almost here! It starts Monday. From Monday through Friday, from 1:00 p.m. to 8:00 p.m. Eastern there will be speakers, inspiration, and refreshment galore for the small price of $24, which includes recordings of the sessions, so you can listen later to what you can't manage to listen to next week. Plus, if finances are tight, there are some ticket giveaways here and there that you can try to snag. I read about on at Ben and Me -- go read and see how to try to get a free ticket!